I have a shaving brush and a razor, what else do I need? 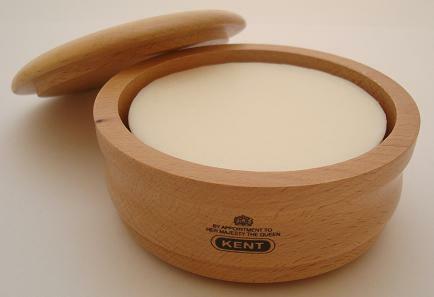 Our large selection of shaving accessiries ranging from mugs and bowls to hold your soaps and brushes to all the creams and soaps for before, during and after the shave, everything to make you feel extra sophisticated while being just as practical. 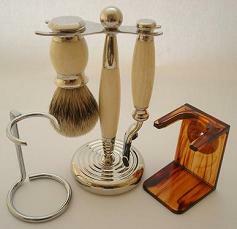 For high quality shaving brushes and razors check here, but for a great gift idea look here. A choice of traditional shaving mugs and bowls.Click on the picture to see the full choice. 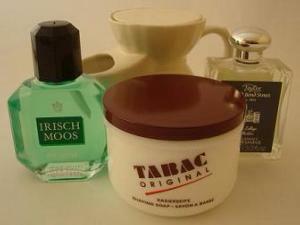 A selection of luxury shaving soaps & creams, pre shave and after-shave treatments.Click to see the full choice. Shaving brushes should be stored "bristles down" to allow free draining and prevent mildew forming in the base. We offer a choice of styles and colours.Click here to view the range of dripstands we offer. Click here to browse our wares of specialist shaving combs and brushes.